Before I began to collect face powder boxes and other beauty ephemera, I collected compacts and vanity cases. 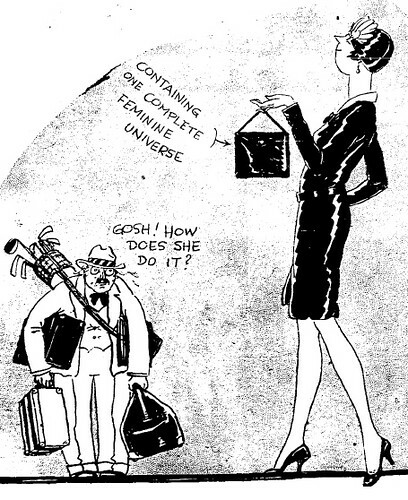 I was recently poking around in the historic Los Angeles Times (from September 20, 1926) and I found a story about a young woman who used her vanity case to hold something other than a lipstick, so I thought I’d share it here. Twenty-four year old Gene Anderson was a lingerie designer , so she she took a particular interest in current fashion, and she loved to wear expensive clothes. But Gene was in the same predicament as many young women were in the 1920s; she was employed but not very well compensated. The average man earned about $1313 per year (approximately $16,276 current USD) and the average woman made about half that amount. 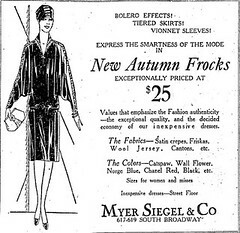 The Myer Siegel & Company advertisement shows a dress that would have appealed to Gene; but it cost a small fortune! The $25.00 frock would be $304.65 in today’s dollars! Gene realized that if she was going to indulge her passion for high fashion, she needed to devise a plan to get her hands on some additional funds. Finally she hatched what she thought was the perfect solution; she’d write rubber checks all over town. As you may imagine, Gene’s plan was rather short-sighted; and after writing thirty-two bad checks (totaling over $1000!) the law caught up with her. Feigning illness, Gene was able to slip away from the officer who had taken her into custody and leap from the window of her Bixel Avenue apartment. The slightly injured woman was discovered later in a local hospital, where she was once again arrested. Upon being searched by a matron at the County Jail, it was discovered that Gene was packing a loaded revolver in her vanity bag! 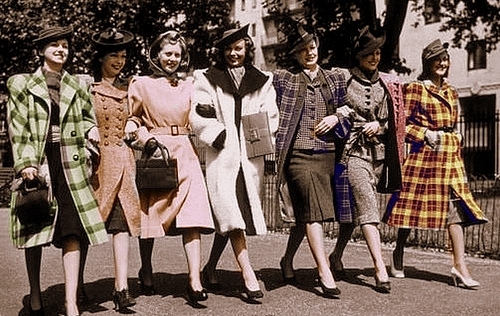 Vanity bags were what modern handbags have become, a home away from home containing everything necessary for spending a day or evening out. Gene tried to talk her way out of the gun charge to no avail. She finally said “I want to go to San Quentin and get it over with”. She had reason to regret her statement. Her application for probation was denied and she was sentenced to from two to twenty-eight years in prison. She served fifteen months of her sentence and was released in January 1928.